Note: Reported data are for each wind plant’s predominant turbine manufacturer. Republished November 29, 2016, 3:40 p.m., to correct an error in the graph. EIA recently started collecting data on wind turbine manufacturers, turbine models, and other wind plant attributes in the Annual Electric Generator Report. As of the end of 2015, just three manufacturers— General Electric (GE), Vestas, and Siemens—accounted for 55 gigawatts (GW), or 76%, of installed wind generating capacity in the United States. Of the 8.2 GW of total wind capacity installed in 2015, these three companies’ combined share is even greater, representing more than 92% of new capacity in 2015. Two other companies, Gamesa and Mitsubishi, also accounted for significant shares (6% and 5%, respectively) of U.S. wind turbine capacity that was operating at the end of 2015. However, these two companies did not have a significant amount of new capacity installed in the United States in 2015. 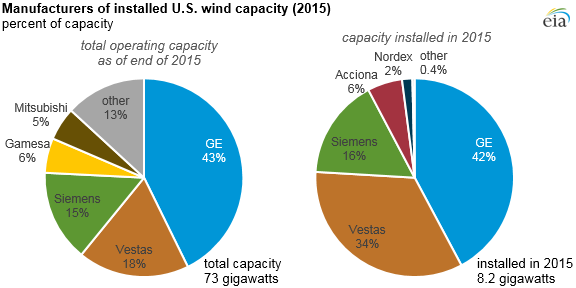 After GE, Vestas, and Siemens, the next largest shares of installed wind capacity during 2015 were held by Acciona and Nordex, at 6% and 2%, respectively. GE has consistently been the dominant manufacturer of wind turbines installed in the United States since it purchased Enron’s wind business (formally Zond) in 2002. 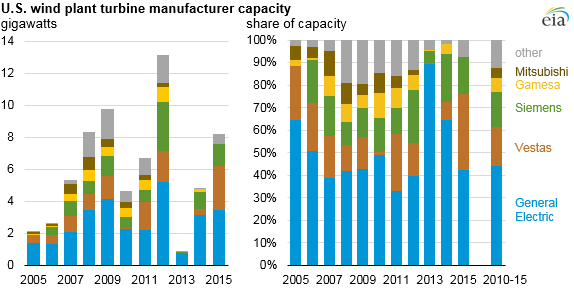 Between 2005 and 2015, GE's average annual share of installed capacity was 44%, or 2.7 GW per year. According to Bloomberg New Energy Finance, the Chinese company Goldwind led in global wind capacity commissioned in 2015, manufacturing 7.8 GW, largely for installations in China. Vestas, GE, and Siemens were the second, third, and fourth largest global suppliers of wind turbines, respectively, in 2015.